New stadiums: NFL now complete at StadiumDB! One rectangular, one circular and one nearly square. Three last stadiums we lacked from the NFL are an interesting set. Please join us in visiting Cincinnati, Oakland and San Diego. Built along San Diego’s northern bypass, the stadium stands out among American ballparks today. It was one of the first, and first so large stadium to have an “octorad” (rounded square) footprint. This unusual layout was chosen to optimally accommodate baseball and American football, however it proved far from optimum in the long run due to compromised sightlines. Built in 1967, this brutalist giant had a horseshoe shape with east side open above the small lower tier. This lowest level of seating was partly retractable (south and south-west corner) to better cater for baseball needs. The horseshoe was partially enclosed in 1983, when the initial capacity of over 52,000 was raised to roughly 60,000. Then in 1997 the building was finally enclosed entirely. This brought capacity beyond the 70,000-mark and also allowed to retain high status among NFL venues long after octorad stadiums weren’t built any more. The building played host to three Super Bowl games, last one in 2003. Eventually the Padres baseball team moved away from the stadium in 2003, making the nearly square layout far from perfect for football. With Chargers considering relocation to Los Angeles, authorities came up with a completely new stadium plan for this location in 2015. Aside professional football and baseball games the stadium was also the place for numerous concerts and other large events. Importantly for our website, these included many football/soccer games, including two Gold Cups. However, not even once this discipline brought a sell-out crowd to the stadium. It came close in 2008, when Mexicans swarmed the building for a friendly against Argentina. Initially the stadium was simply named San Diego Stadium, which makes sense after the city financed it with bonds. But in 1980 Jack Murphy took the name. He was honoured in such manner for leading to the stadium’s erection in the first place. Murphy was a journalist who campaigned for this project. And despite Qualcomm acquiring naming rights for two decades in 1997, many locals still call it The Murph. In late 1990s it was decided that Cincinnati’s Ohio River wharf will change dramatically. Existing Riverfront Stadium, though built only in 1970, was considered unsuitable for Bengals (NFL) and Reds (MLB), which prompted the decision to build two separate stadia for American football and baseball. The football one was planned to the west, while baseball stadium to the east, partly in the place of Riverfront Stadium. 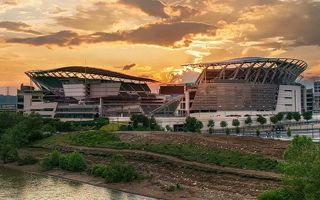 Bengals new home was the first one to get built, seeing construction begin in April 1998 and end in the summer of 2000. At that time it was one of the most modern and impressive stadiums across the US and beyond. Its outer appearance was very impressive. The dynamic silhouette was achieved mostly with structural elements, like the steel roof topping west and east side. This is where the stands reach peak at 47.8m. Stadium design was carried out by NBBJ and most notably Dan Meis, who later opened his own office. The concrete and steel giant rose significantly above surrounding land and could be dwarfed only by downtown office towers, which many fans are able to see during matchdays. Lower north and south ends provide interesting views on the city skyline and the state of Kentucky just across the river. The stadium stands nearly on the border of Ohio. Comprised of three tiers along the field, stands can hold over 65,000 people for most events. The number includes (what was very high percentage at that time) some 7,600 business seats and 114 skyboxes. From the very opening the stadium has been the home to Bengals, who have their training fields just outside. Also thanks to the team’s tiger theme, the stadium is nicknamed The Jungle. But aside of the NFL side, many other teams in American football and association football also played host on numerous occasions. Since 2012 the venue also hosts large concerts and every year a major… chess tournament. First images of the stadium were released in late 1960, but it wasn’t until 1964 that construction actually began. The multi-use stadium was opened in Sept 1966 and has since served as the home Oakland baseball and football, primarily Athletics and Raiders. Just as its name, the stadium’s layout is interesting. It was designed nearly as a perfect circle, thus the Coliseum reference. From the outside it seemed very modest, but that impression faded after entering. The reason was most of the stands were built below ground level. The entire lowermost tier was built in a sunken area, while second one rests on landfill. Only the third has concrete structure raising above the seemingly green area. In its early decades the stadium had the east end open. Allowing batters to hit the ball out, the open end also gave a picturesque view of Oakland hills. This changed in 1996, when a massive grandstand enclosed the east. Hardly fitting to the stadium’s aesthetics, this 10,000-capacity concrete block raised high above previously built structures, blocking the view and spoiling layout for baseball enthusiasts. For football this was a worthy addition, but still didn’t prevent the Coliseum from becoming the very smallest NFL stadium in 2015 (not counting temporary venues).